We've been busy trying to get the house in shape for Thanksgiving. It's amazing what a deadline can do to inspire projects to get done. Since most of you will be here for Thanksgiving I'll wait and share some pictures later. 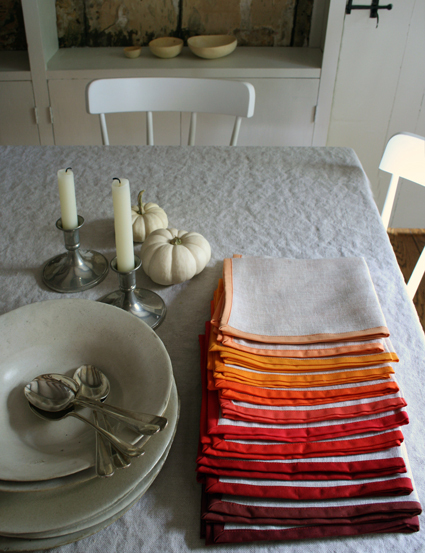 But, until then, here's a little peek at the napkins I'm making to use at our Thanksgiving table. I got the idea here and I really love their tradition of creating a new set to use each year. I think I'll steal that too. On another note, I got a new job! I will be leaving the prosecutor's office December 3rd and hopefully starting at The Department of Public Safety on December 6th. I'm sad to go, but looking forward to a new set of problems and challenges--this time ones that don't involve horrific abuse of women and children. Ahhh, I can already feel the weight lifting from my shoulders.